I had such fun designing an assemblage display piece for Tim Holtz’s 2015 Craft & Hobby Association (CHA) booth using current and all new for ’15 Tim Holtz products, many from his idea-ology line. 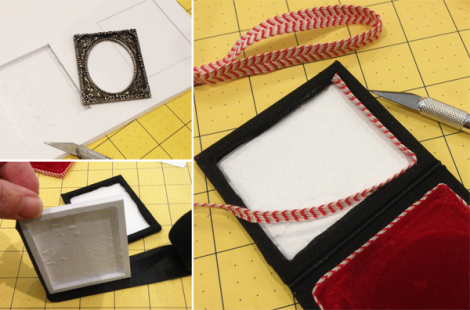 As a focal point for my project, I created a faux pocket-frame daguerreotype. To make that I started with the gorgeous Tim Holtz Metal Foundry Frame. 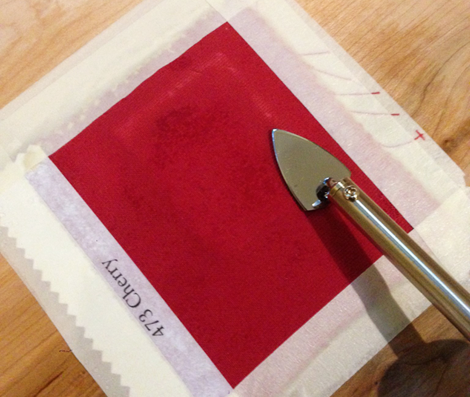 Laying a moistened swatch/scrap of red velvet face down over the frame, I used a mini iron to press the back and created an embossing of the frames ornament. I wrapped the trimmed out section of velvet around a piece of cardstock with a small bit of cotton pressed between to create a little cushion effect. I traced the frame twice to foam core board and using an Xacto knife, cut out the top paper foam layers, keeping the back paper layer in tact. I trimmed out a frame about 1/4″ around that to make two sections. I wrapped each section in fabric bicycle handle tape, pressing the tape into the opening of the frame. I used the same tape to hinge both frames together from the back. I cut some woven ribbon from Tim Holtz Naturals Red & Cream Trimmings to line each inner frame area. I glued the velvet panel into one frame area. 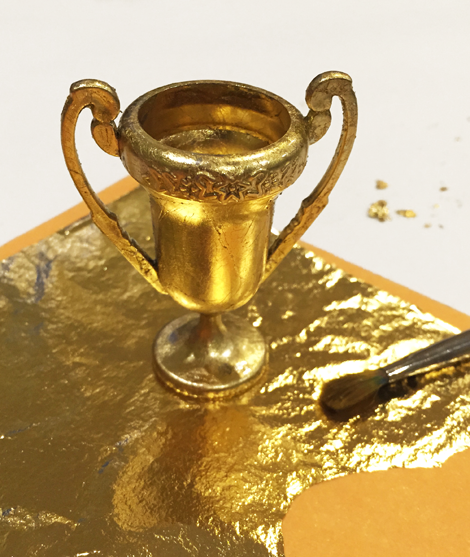 I pulled out my handy gold leaf kit and worked over an adorable little Tim Holtz Trophy Cup. I did the same to the Foundry Frame, and antiqued both with Tim Holtz Ranger Ink Distress Ink in Frayed Burlap. I trimmed a bit of clear plastic from some product packaging and used as the “glass” in the frame, placing a picture of a little girl trimmed from a Tim Holtz Found Relatives Portrait card under it. I glued the Foundry Frame portrait into the second foam core frame. I used the decorative backside of one of the portrait cards to finish off the back of the pocket frame. 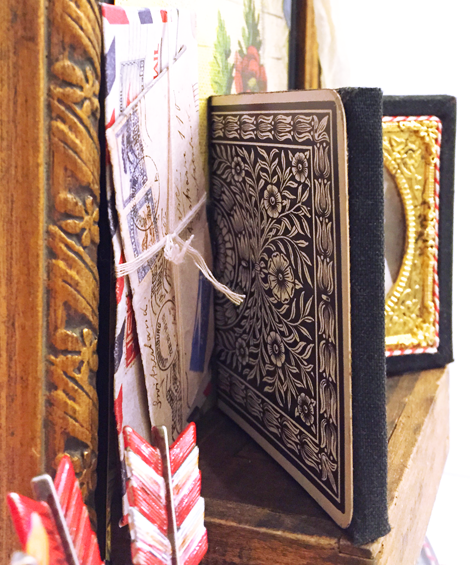 I trimmed little envelope images from the new Tim Holtz Correspondence Paper Stash and folded them into little letters tied with string to tuck behind the pocket frame. 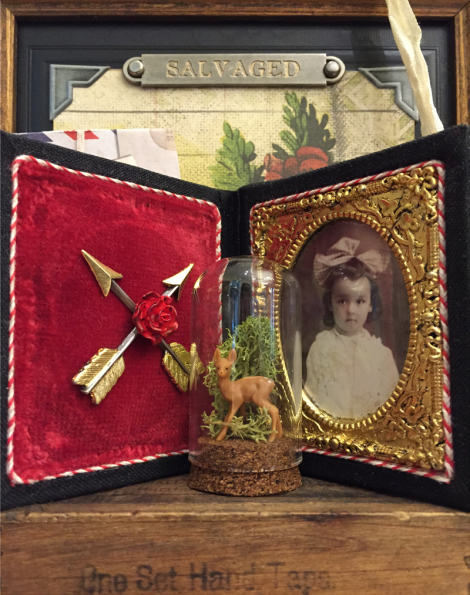 As a base for my piece I used a vintage wooden pedestal frame found (with cabinet card photo in tact) at a local antiques store. 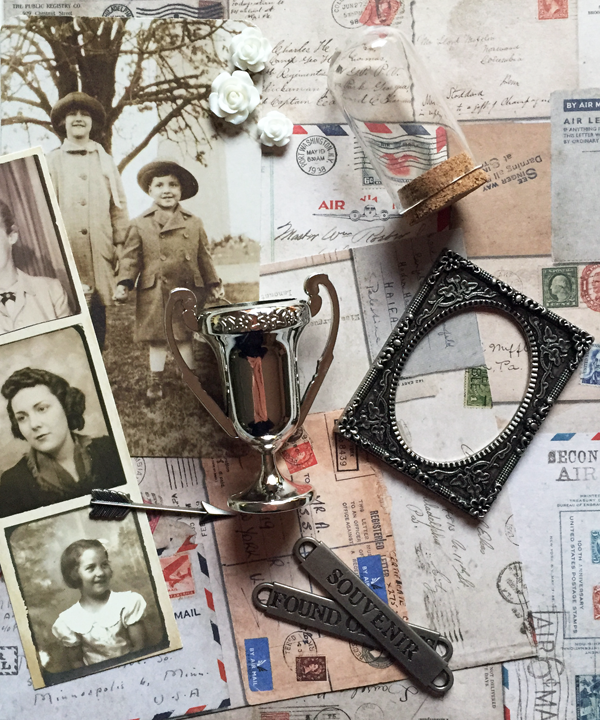 I covered the old photo with beautiful floral paper from the Tim Holtz Wallflower idea-ology cardstock, photo corners from the new Industrious Chiseled Stickers, and finished with a Tim Holtz Metal Observation Word Band. I attached a little vintage wooden parts box the lower section of the frame to serve as a shelf. Atop the shelf I placed the pocket frame embellished with Tim Holtz Adornment Arrows (gold-leafed) and one bloom from his all new Miniature Heirloom Roses painted and antiqued. 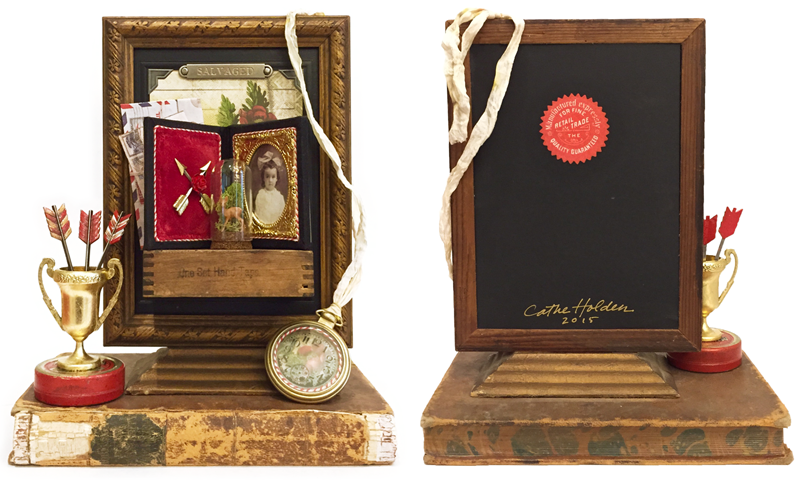 In the very center of the little shelf sits an adorable little Tim Holtz Corked Dome. This is the larger of the two in the set, and I darkened the cork with a marker. Inside is a tiny plastic deer and a snippet of moss. 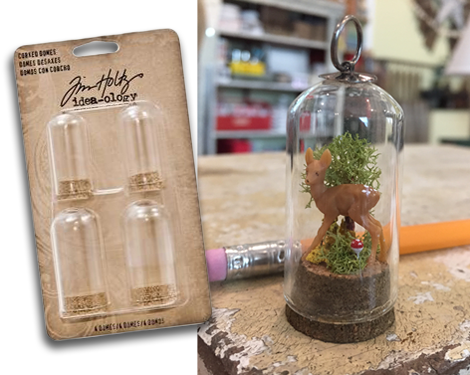 While on a roll, I used the smaller dome that’s just under two inches, (again darkening the cork) with another mini deer, moss, and a ball-head pin from my pincushion painted red with white dots to serve as a forest mushroom. I attached a modified Tim Holtz Ring Fastener to the top creating a little charm for fun. 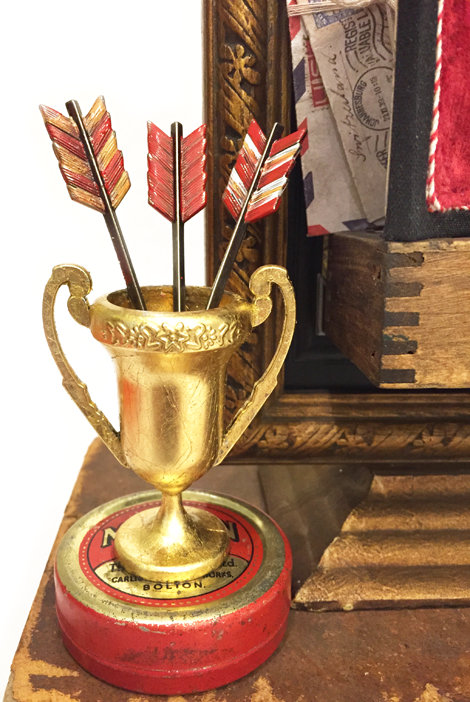 I painted and antiqued the feathers of the larger Adornment Arrows and glued them down into the Trophy Cup. I attached that to the top of an old advertising tin as a pedestal. 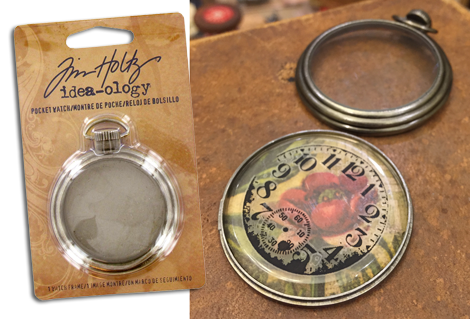 Using the Tim Holtz idea-ology Pocket Watch, I trimmed and placed a floral section from the Wallflower idea-ology cardstock. 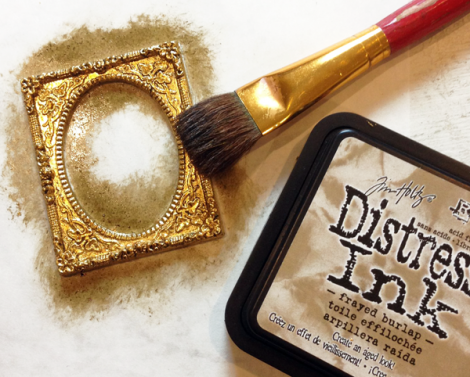 I cut the dimensional area from the product’s bubble pack and rubbed on the clock face image from Tim Holtz Numbers Remnant Rubs. I placed the bubble over the flower paper, and used more of the red and cream trimming to finish off the watch face. 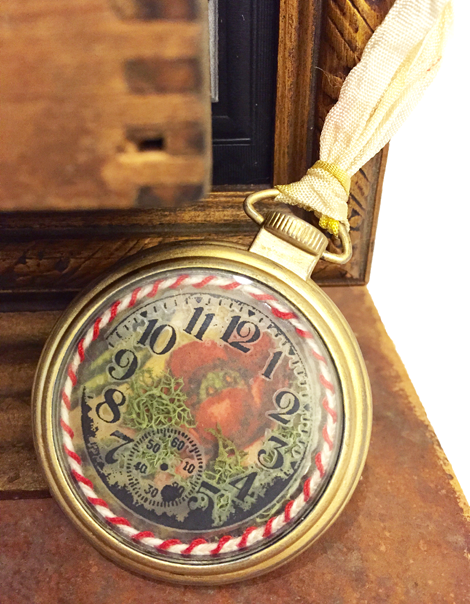 I used a gold paint marker to re-color the metal areas, and strung the pocket watch with stained Tim Holtz Crinkle Ribbon. I painted Beacon 527 along the side page sections of an antique arithmetic book to seal it closed. 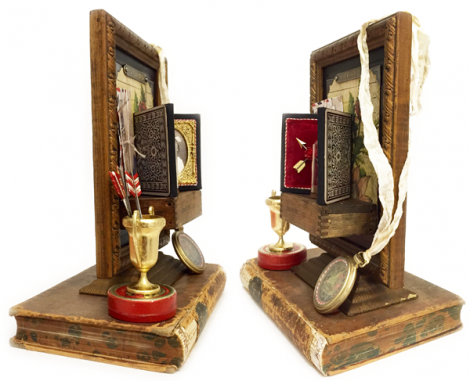 The book served as the platform for the entire assemblage. I finished the back of the piece with black matte board, a fun red paper seal from the Tim Holtz idea-ology Thrift Store Ephemera Pack, and my signature. 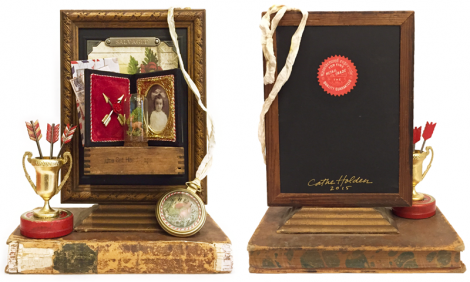 There were many other designers who created spectacular pieces for the Tim Holtz CHA booth, so keep watching his blog for upcoming features. Be sure to follow Tim on Instagram and Twitter at @tim_holtz and exciting captures from the show from many using the hashtag #timholtzCHA2015. 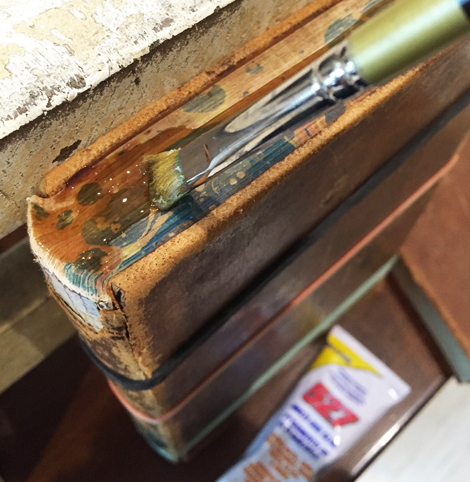 In addition, follow friends Paula Cheney @luckyday and Mario Rossi @mariojrossi on Instagram for exciting Tim Holtz behind-the-scenes (BTS) shots! 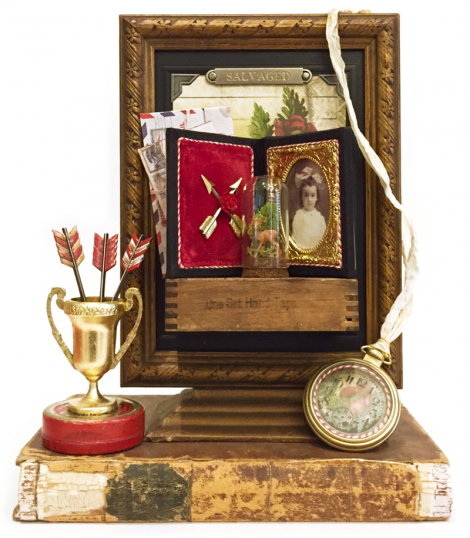 This entry was posted in assemblage and tagged 2015 CHA, Assemblage, idea-ology, Tim Holtz. Bookmark the permalink. This is AMAZING! Thanks for all the detailed steps. Love it Cathe! You transformed his pieces into a beautiful vintage inspired display. Thanks for sharing your process. This is so amazing! I saw it in person and took a photo not knowing it was yours. Its in the pictures I took from CHA yesterday that I posted to my Facebook page. I just love those little trophy cups and cant wait to have some of my own – although one was used in their make n take so I do actually already have one. Great piece…. and really appreciate the play by play! I absolutely love this piece – your creativity knows no bounds – amazing!!!! Thanks so much Cathie !! Love your detailed descriptions helps so much! Love your work! Somehow I stopped checking your blog and lost track of your amazing work. Why? I have no idea but what a loss to me. I will not make that mistake twice. I love the project you made for Tim’s booth. As always your imagination is so inspiring. Just amazing, Cathe! Having you detail the process makes me appreciate it even more! Hi, I was wondering where to buy the cork dome pieces . I have been looking and haven’t been able to fine.